Legadex’s partnership with legal software specialist effacts, part of Wolters Kluwer, has morphed from a fairly basic database solution into a suite of slick, time-saving, high quality managed legal services that include decision trees, intuitive workflows, comprehensive cloud services and e-signature solutions. We spoke with Maurits Annegarn of Wolters Kluwer and Jacqueline Bloem of Legadex about the evolution of the partnership, where they see it going – and the upcoming expansion of the effacts offering and accompanying rebrand. The Legadex-effacts relationship goes back 10 years – almost ancient history in software and business services. Yet it remains fresh, because the underlying logic of using smart software to create efficient legal services that shake up an industry remains as valid as ever. But it also remains fresh because the relationship, services and business model continue to evolve. In the beginning, the partnership worked like this: effacts would set up the databases and workflows, and then Legadex would come along and fill the system with content, often at the client’s offices, and train the customer’s paralegal and non-legal staff in how to use it. So how have the partnership and platform evolved? What has driven this evolution? You can find contracts and company structures in just a few clicks, and the software can be tailored to the diverse wishes of our clients. What issues do you typically run into? Jacqueline: “Yes, companies often simply don’t have enough people, or the right people, to get their database and workflow up and running within a reasonable timeframe. We work on the basis of a clear project plan with defined deliverables in terms of output and timing. The work is performed by our internal team of effacts-certified counsel and paralegals. This enables us to complete implementation projects within a couple of weeks, for smaller companies, and several months for corporates with over 100 legal entities. Without such a structured approach, companies run the risk of never getting their database and workflow fully filled, up and running. Over the last few years, effacts has moved from on-premise software to cloud-based services. This has enabled Legadex to expand its offer via the effacts platform as most of the work can now be now be done at the Legadex offices. This flexibility enables more efficient work processes and typically results in substantial cost savings for the client. Many smaller and mid-sized companies lack a professional legal information and workflow platform as they feel that it is too complex and too costly, or because they simply don’t know what is available. Many companies, especially SMEs but large corporates as well, also find it difficult to attract the right people, often experienced paralegals, to do this type of work. Or, there’s simply not enough of it to create a full-time position. This is where LegadexOnline comes in. Legadex’s HassleFreeLegal concept supports such companies in a flexible, professional and cost-effective manner with effacts-certified paralegals. This enables companies to outsource their commodity legal work to Legadex and use the effacts platform and license as part of their Legadex managed services. LegadexOnline provides clients with 24/7 access to entities and contracts, an always up to date single source of truth, qualified and dedicated legal support, compliance and auditability, and predictable fees and savings. We benefit from Legadex’s legal knowledge and effacts’ expertise. Our consultants are very tech-savvy with the system, but they are not legal experts. What triggered effacts and Legadex to integrate your services? Since effacts was acquired by Wolters Kluwer in 2015, the company has been able to step up the pace of software development and has added many functionalities in the last couple of years. Effacts can now integrate with more solutions than ever, including the most popular e-signature solutions, but customers can also choose to make their own connectors. How do you see effacts developing? The other big news is that effacts is to be rebranded as Legisway Essentials. The move follows Wolters Kluwer’s recent acquisition of Legisway, a French legal software provider for mid to large-sized corporate law departments. In the coming months, Wolters Kluwer will launch Legisway Enterprise (the Legisway product formerly known as Contrat’tech) in several more countries, including the Netherlands. 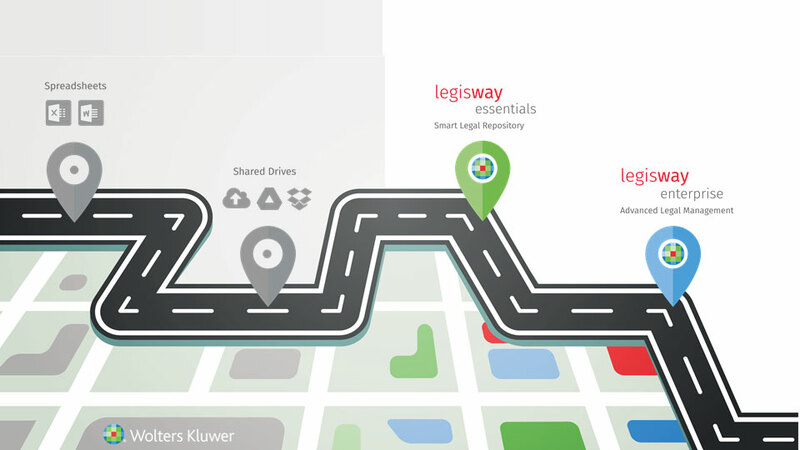 Legisway Enterprise is similar to effacts but expands its functionalities with an advanced legal management solution featuring dynamic workflows, embedded legal expertise, contextual data entry and much more. In a way, it is the perfect step up from effacts for a Legal team that is looking to truly take control of all legal operations. What are your plans regarding Legisway and effacts? What impact will the rebrand from effacts to Legisway Essentials have on your clients? After studying notarial law at the University of Utrecht, Jacqueline joined Legadex in 2012. As Team Leader Corporate, she is specialised in project management relating to corporate housekeeping and contract management, in addition she coaches and trains 20+ young support lawyers / paralegals within Legadex. Maurits joined effacts in 2011, becoming its seventh employee and first business consultant. After Wolters Kluwer acquired effacts in 2015, Maurits became part of Wolters Kluwer’s global Legal Software organisation. Today, as Segment Manager for the Corporate Legal market, he is responsible for the launch of new software solutions and making sure the Wolters Kluwer Legal Software portfolio fits the needs of the modern Legal professional.